This summer has been rough. As someone who lives for the hiking season, I'm used to moving at a breakneck pace: trail runs before work and little summit hikes after, hitting a new trail or peak or camp spot every weekend, and backpacking for several weeks at a time. But this summer we've spent more weekends in hotels than our sleeping bags and hit more weddings, baby showers, and family get-togethers than trails. Each of these events has been a blast and we've been honored to attend, but in aggregate, they've taken their toll (as I write this, I'm sitting in the rental car agency waiting for the locksmith to retrieve our keys, errantly locked in the trunk). And we're only about half way through. I'm a girl whose best self comes out outdoors, and I've struggled being cooped up in coach. This trip has given me time to reflect on a few strategies I've employed to bring those things I find most therapeutic about the outdoors into my every day life. Because you're not you when you're hangry. One of my favorite things about backpacking is the narrowed focus. Priorities for the day revolve around basic necessities: what to eat, where to sleep, where to poop, and not getting lost. When I return to normal life, I'm quickly overwhelmed by the innumerable extra challenges that sap my time and energy, keeping me in constant catch-up mode. By taking a page out of my backpacking playbook and planning my meals, outfits, and workout routine at the beginning of the week, I can make sure I meet my basic needs with minimal thought or effort. Sure, if I have free time, I improvise. But by planning for the whole week on Monday night (because let's face it, weekends are for playing) I can make sure that when things get hectic I don't have to waste time or energy figuring out the essentials. When you need to create your home from scratch every night, routines inevitably form. Another thing I love about backpacking is the efficiency. My daily chores use the same items in the same pattern every time I do them. Instead of thinking about what I need to do, I only need to think of how to adjust if conditions require it. It's a lot easier than starting from scratch! In our day-to-day, we lose a lot of time trying to figure out what to do and how to do it. This is doubly true when coordinating our activities with others. By creating routines for the tasks I can anticipate, I am able to streamline my actions and avoid the "decision down-time." It ensures that we know how and when all of our mandatory activities get done so that we can focus our energy on the "want-tos" instead of the "have-tos." Would you want to carry things that you seldom use? NO! So follow that logic at home and don't saddle yourself with the baggage of junk that is only useful a couple times a year. On backpacking trips, every item you carry has a purpose. Often, more than one. Anything that doesn't add value doesn't make the next trip. In day-to-day life, we tend to accumulate lots of belongings based on their ability to serve a purpose either immediately or at some point in the future. We end up with lots of stuff that requires lots of time to clean, organize, and decide how to use, and not a lot of time to actually use it. Once I started to plan my meals, outfits, and workouts and created a routine for chores, I realized that I actually needed way fewer things to complete my daily routine than I thought. I was able to pare down my belongings to a few go-to items (whose replenishment I automated via Amazon subscriptions) and a small cache of emergency supplies. Now all my shopping, from groceries to clothes, is easier, more efficient, and so much more cost effective. It might seem like such simplification and definition would take the fun out of my day-to-day, but by having go-to meals and outfits pre-picked, it frees up my time and energy for post-work paddle boarding, writing, and creative projects... the stuff that ACTUALLY injects fun instead of just the illusion of it. Backpacking trips, and vacations in general, feel saturated with memorable moments. In truth, they contain no more opportunities for memories than any other equivalent period in our lives, but our openness to making memories is much greater. When I'm backpacking I'm not checking my phone, stressing about dinner or thinking about an impending meeting. I'm simply living. I'm cataloging the flowers we pass, looking out for bears, focusing on traversing a log so I won't fall into a creek. I'm in the moment. In my normal life, chaos is my default position: always worrying about what I need to do later instead of focusing on what is happening now. By streamlining my completion of the "needs" and creating time for the "want-tos" by simplifying my daily routine, I've been able to settle down, take a breath, and learn to enjoy the memories made in the in-between moments. 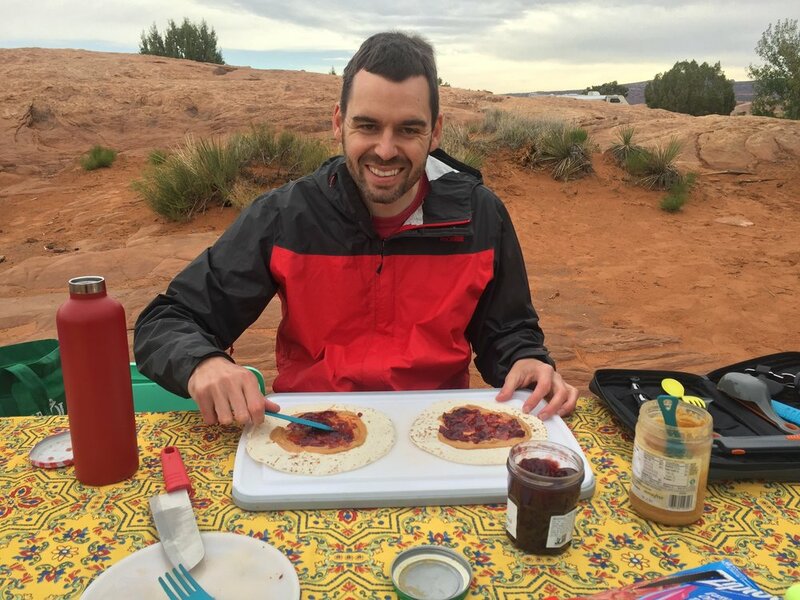 I've enjoyed as many smiles in our kitchen as I have in the great outdoors (although taking my man car camping for the first time brought me the best of both worlds). Taking the time to truly be immersed in and enjoy the little things has greatly reduced that sense of anxiety and enabled me to be grateful for all the wonderful memories that happen in the in-between. 5. Always remember that adventure is just "discomfort recounted at leisure"
When challenges that disrupt our best laid plans, it is easy to get cranky and resentful. The event that prompted me to write this, accidentally locking our keys in the trunk, ended in us missing a wedding reception, a Berkshires hike, and a lot of those relaxing in between moments you look forward to when spending the weekend in a nice hotel. We had every opportunity to get angry, place blame, and end the trip in a sour mood, but what fun is that? Like thunderstorms on your camping trip, challenges may dampen the mood, cause you to change your plans, or abandon them altogether. But how you weather those storms will define whether you end up with a bad memory or an adventure worth of many campfire retellings.